I know there are high tech, jewel studded, or cute colorful practical row counters and stitch markers out there but there are no stories behind them. Nothing is quite the same in generating conversations and sometimes even warming your heart with that satisfying feeling than all things homemade regardless of the quality of said item. For the environmentally conscious people as I try to be, reusing/recycling otherwise wasted materials has even further significance. Since I don’t venture outside of my immediate neighborhood much and also have been raised to avoid the shopping habit of buying things I don’t necessarily need, creating clutter, I get plenty of chances for homemade “experiments” if I can manage to scrounge up all the required materials at home. When I first started knitting, row counter was not even a concept… didn’t know such a thing existed. I finished knitting scarves, socks, hats, even sweaters without ever needing one. As I progressed to larger, more complicated patterns though, the desire to use it arose. The main benefit would be efficiency, saving time. I could put a project down and come back any time, and it could be months, later knowing exactly what point to pick up without reviewing or counting the pattern all over again. Not surprisingly, a person who didn’t go out much, such as moi, would not find stitch markers and row counters at the few stores she frequented. Luckily the internet is such a huge resource for information that I learned many materials can be used or put together to substitute as a marker / counter. So….. Enough talk and let’s look at the darn homemade row counter already! It’s light weight and hangs right on the project, bright and colorful, and easy to read. It works so well for me, I thought it would be fun to share it with people. All it took was some leftover wires and beads that came with my kids’ rock painting kits. Here are the step by step pictures. It cannot be easier and would be a fun project for kids too. Cut a 5-6″ wire. Twist it around a pen along the middle of the wire to form a loop. Put the number of beads you need through one end. I put in 10 beads to keep track of multiples of up to 10-row repeating patterns. To keep track of total number of rows knitted on a larger project, make more counters with bigger beads, each denoting 5, 10, or more rows per bead, to use together with the first counter. Close the loop by twisting the ends of the wire together. Make sure the cut ends are twisted to the inside of the loop to avoid snagging the yarn when you hang the counter on the needle. I have never had a problem with this wire maybe because of the plastic coating. Done! Use a permanent marker ( I used black) to make a mark near the bottom on one side of the loop as the side counting the completed rows (see figure 3). If you don’t do this, later you won’t be able to tell right away without re-examining your project and the pattern which side is telling you how many rows you have done. I usually place the counter, which can be used as a stitch marker at the same time when needed, onto the needle when I work up to the middle of the row, sliding one bead over to the marked side of the counter indicating row 1. When you come upon the counter again as the knitting progresses, take the counter and slide one more bead over to the marked side to indicate one more row completed. Then slip the counter as if it were a yarn stitch, or as you would for a stitch marker, onto the right needle and continue knitting. In figure 4, I have completed the second row of a lace pattern that repeats over 8 rows. In this case, I wouldn’t be sliding over all 10 beads before repeating from row 1 again. By using two counters side by side, one counting by 1 bead = 1 row and the other 1 bead = 10 rows for example, one can keep track of over 100 rows, if one ever needs to. A even more helpful use for me is when I need to cast on projects with over 100, 200, or more stitches. Just slip on the counters as markers at whatever intervals that are convenient as you cast on (for me, usually after every 50 stitches or so using 1 bead as 10 stitches) and there would be no need to double check the number of stitches all the way back from stitch 1. Let’s say one of your little ones is calling you to the bathroom to help her wipe after #2, in the middle of casting on 144 stitches. No problem. Just go ahead and finish that important duty then come back to your needle and recount from the last counter you placed. The counters can be taken out when row 1 is being worked on. 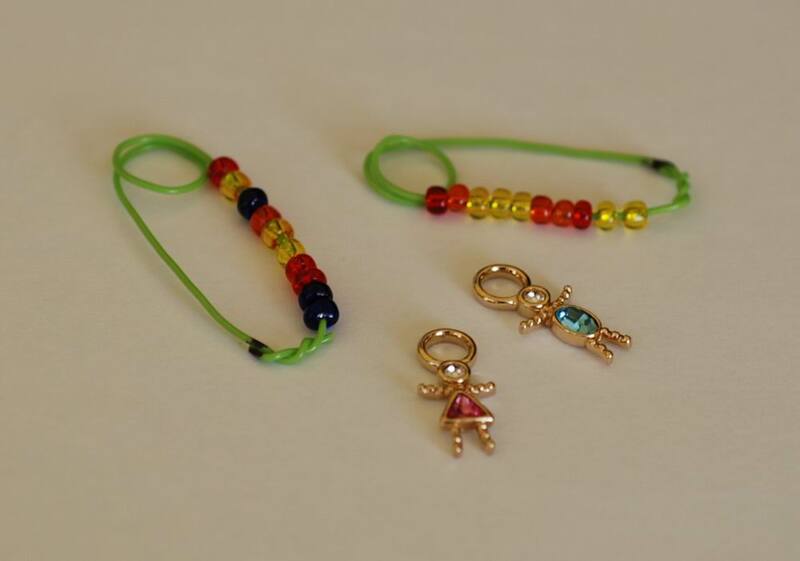 Many other small items around the house can also be used as stitch markers. Figure 4 above includes dangling earring parts ( blue boy and pink girl figurings) that I don’t wear anymore doubling as stitch markers now. 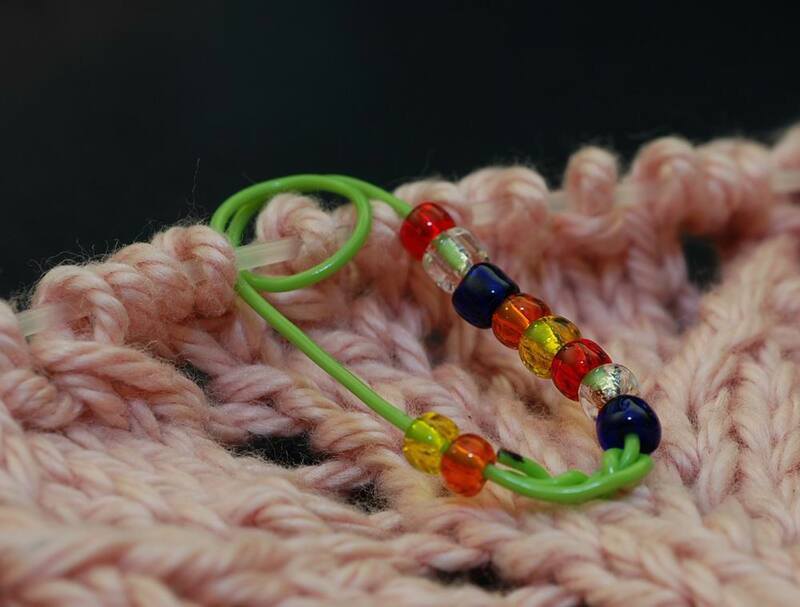 Small o-ring is another example of improvised stitch marker. I am sure there are a lot of creative people out there doing the same thing. I hope they comment and share what kinds of interesting materials they have used to aid their knitting.